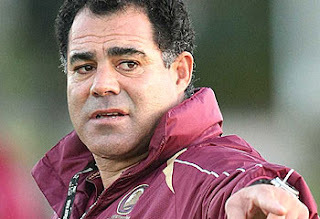 Mal Meninga's record-breaking reign as Queensland mentor is set to end after he was offered the Kangaroos coaching job. Meninga has made no secret of his interest in coaching Australia after the long-serving Tim Sheens left his post earlier this year to take up a position with Super League outfit Salford. Meninga has agreed to coach the Maroons, who he has led to victory in nine of the past 10 State of Origin series, for the next three seasons. But chairman Peter Betros said the QRL wouldn't prevent the former international from moving into the Australian set-up. "He's been offered the Kangaroos job," Betros told News Corp.
"He's agreed to coach the Maroons for another three years but we won't stand in his way if he wants to take the Kangaroos job." Betros said a decision from Meninga was likely on Monday. Sheens last coached Australia in their 26-12 loss to New Zealand in the Anzac Test in May. Michael Hagan, who was released from his role as coaching director with Newcastle earlier this week, is one possible successor to Meninga at the Maroons. Hagan coached Queensland before Meninga in 2004 and 2005, winning two of six matches and losing both series. Meninga has won 20 of the 30 games he has coached at Origin level since 2006.